Legacy design - That's the way the previous admin set it up. Networks with 100 printers or more might need multiple servers to spread the printing load. Networks spanning multiple physical sites or subnets can have separate servers minimize cross-site network traffic. A local desktop printer attached to a system is also a remote print server. One of the servers on the network needs to be nominated as the primary server. This system runs the Application ServerAn Application Server is the primary server program responsible for providing the PaperCut user interface, storing data, and providing services to users. 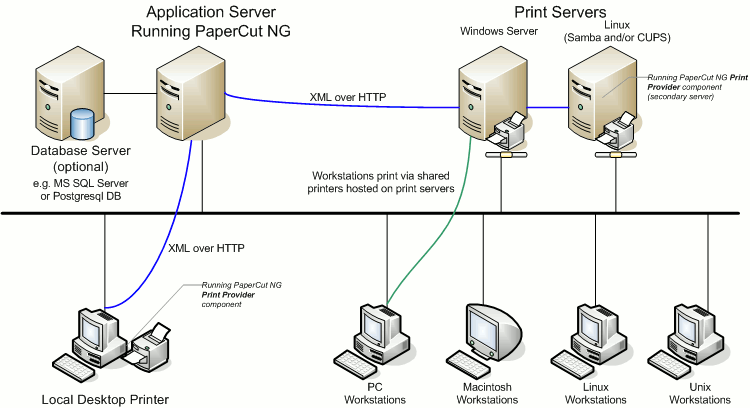 PaperCut uses the Application Server to manage user and account information, manage printers, calculate print costs, provide a web browser interface to administrators and end users, and much more. software responsible for providing the user interface, storing the data, and managing the application logic. The system nominated for this task is usually a print server (but could be any server). It needs to be a system with spare capacity to run the PaperCut NG/MF Application Server software. This system should have good performance, have at least 500 Mb of free hard-disk space, and be included in an off-disk backup routine. Other print servers are known as secondary servers. These servers run the Print ProviderA Print Provider is a monitoring service installed on a secondary print server to allow PaperCut to control and track printers. This monitoring component intercepts the local printing and reports the use back to the primary Application Server. component and communicate back to the central server. The following diagram illustrates this setup. When a client prints to a secondary serverA PaperCut secondary server is a system that directly hosts a printer, that is, a print server with a Print Provider installed. 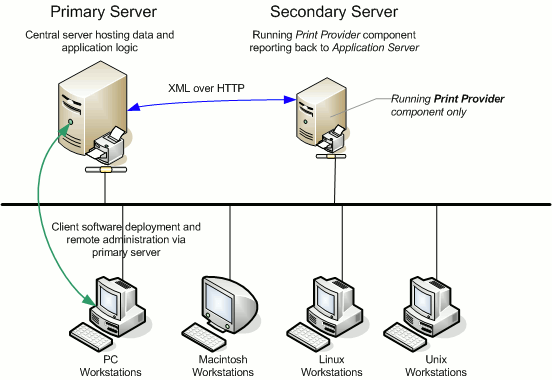 A secondary server can be a server style system hosting many printers, a desktop style system hosting printer(s) also shared to other network users, or a desktop style system with the printer used only for local users (not shared)., the Print Provider intercepts the print job and forwards the information to the central server for processing. Communication is via XML Web Services over HTTP on the PaperCut Application Server's nominated port (normally port 9191). The web servicesWeb services are a standardized way of integrating Web-based applications using the XML, SOAP, WSDL and UDDI open standards over an Internet protocol backbone. protocol is specifically designed to facilitate easy firewalling, scalability, and works over a wide range of network speeds. Communication between servers uses minimal bandwidth. Physically separated servers connected via WAN links, VPNs or other slow links are supported with minimal or no impact on printing performance. All data, logging and configuration information is stored on one single central server facilitating central backup from one location. Management is conducted centrally from one location.